A plan to save money by transporting trash from Tisbury and Oak Bluff by barge to New Bedford for disposal is under development and looks promising, according to Tisbury department of public works director Fred LaPiana. In a recent phone conversation with The Times, Mr. LaPiana said that John Packer is working on a proposal for his family’s company, Tisbury Transportation and Towing, to provide barge service to transport municipal solid waste (MSW) and construction and demolition debris (C&DD) generated by Tisbury and Oak Bluffs. The trash would be shipped in containers by barge from the Packers’ local dock to one they own in New Bedford. The Oak Bluffs-Tisbury refuse/recycling cooperative (OBTRRC) is one of two Island waste management entities. The Martha’s Vineyard Refuse Disposal and Resource Recovery District (MVRDD) manages solid waste for Aquinnah, Chilmark, Edgartown, and West Tisbury. Oak Bluffs and Tisbury operate separate local drop-off stations, as well as a joint transfer station in Oak Bluffs, which is run by Bruno’s Roll-Off of Edgartown. Currently Bruno’s transports MSW by truck to the Covanta SEMASS facility in Rochester, where it is converted to electricity through shred-and-burn technology. OBTRRC representatives began looking at trash disposal sites in 2009, knowing that SEMASS had a number of long-term contracts with Cape towns, including its own, that would expire over the next five years. At that time, Mr. LaPiana said SEMASS was reevaluating its rate structure and it was likely prices would go up, not down. Several months ago, Oak Bluffs and Tisbury were successful in procuring a long-term contract with the Greater New Bedford Regional Refuse Management District, operated by the town of Dartmouth and city of New Bedford. Mr. LaPiana said the OBTRRC made the decision to go with Crapo Hill Landfill on the basis of economy over the long term. New Bedford will charge $59 per ton for the first couple of years. SEMASS offered a price of $72 per ton for a future contract. Starting November 1, Bruno’s will truck MSW to the Crapo Hill Landfill. Gases created by decomposition within the landfill are used to generate 3.4 megawatts of electricity, according to Crapo’s website. The trash by barge component is also expected to cut costs. Oak Bluffs and Tisbury contracted HDR Engineering in Boston in April 2011, to conduct a study to evaluate the feasibility of establishing a port-to-port containerized freight service between Martha’s Vineyard and New Bedford. The study focused on the potential for barge service to transport MSW and C&DD generated by Tisbury and Oak Bluffs. In a report to the SSA administration, board and port council members at a meeting in July, Mr. LaPiana said the study found that Oak Bluffs and Tisbury could ship refuse less expensively by barge to New Bedford than on SSA ferries to Woods Hole, if they transport at least 18 containers per barge. SSA members weighed some of the pros, less truck traffic in Falmouth, and the cons, revenue loss from fewer trucks on the ferries, and agreed they would discuss it further. Currently Bruno’s uses seven open-top trailers to transport waste from the station, using an SSA freight boat on a daily basis, according to the study. SSA general manager Wayne Lamson provided an update during a general discussion about SSA matters at the Tisbury selectmen’s meeting on September 4. With the SSA on board, Mr. LaPiana said the next step is to make the barge proposal work economically. 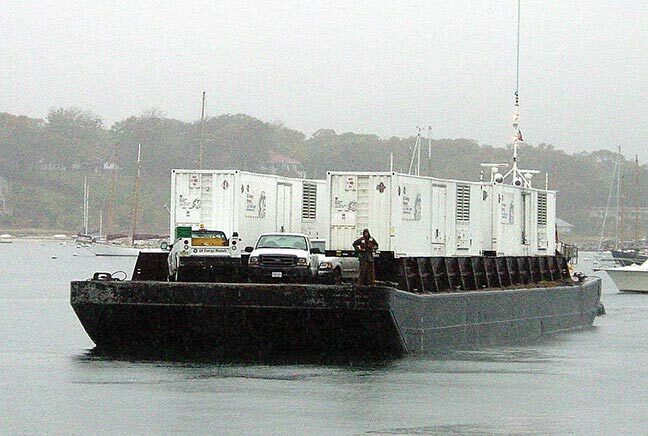 Tisbury Transportation and Towing would need to buy or lease another barge to transport waste on a consistent basis, according to the feasibility study. To give Mr. Packer more time to work out the details, last week the Tisbury selectmen approved Mr. LaPiana’s request to extend the transfer station contract with Bruno’s Roll-Off to February 28, 2013. The OBTRRC’s current plans are a departure from a move a few years ago towards regionalization with the MVRD. The towns of Tisbury and Oak Bluffs withdrew from the district in 1993 and formed a separate municipal partnership for waste management. The Island’s two refuse management entities started discussing the possibility of creating a regional waste district in 2007. In town meetings held in the spring of 2009, Oak Bluffs and Tisbury voters authorized their selectmen to enter into an agreement to use money available in a joint transfer station fund towards leasing, with an option to buy, 11 acres next to the Edgartown transfer station in the event it would require expansion as an Island-wide facility. The OBTRRC requested and received approval from voters in both towns to raise and appropriate $1.5 million, which would be offset by about $400,000 in joint revenue received from the transfer station. “We wanted to get the whole amount of money needed to negotiate the purchase of the property, then discount that from refuse receipts thus far,” Mr. LaPiana said. Due to what he called a “change in environment,” the money was not appropriated and the $400,000, although obligated, has not been spent. Under the change, the DEP no longer has local jurisdiction over transfer stations with volumes under 50 tons a day, Mr. LaPiana said. Now, both districts are regulated by the Oak Bluffs and Edgartown boards of health, in the towns where the transfer stations are located. Mr. LaPiana said discussions about Oak Bluffs and Tisbury rejoining the MVRDD are still on the table. MVRDD manager Don Hatch told The Times in a phone call Monday that the district is not currently pursuing any change to its charter, given that Oak Bluffs’s and Tisbury’s interest in rejoining has changed.